GameDay by SportsTG is the ultimate destination for community sports participants, administrators and fans. Stay up-to-date with your favourite teams and keep an eye on your rivals by accessing the latest match results. View your upcoming fixtures, get directions to your next game, and find out where your team sits on the ladder. GameDay provides easy access to the SportsTG network that is used by more than 4 million participants and over 64,000 clubs and associations. 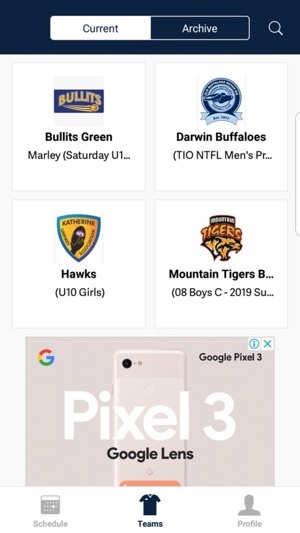 * Now when you find the competition you are looking for you will be taken to the competition home page - View Competition Schedule, Ladder, Competition Stats, Round Stats & Teams in Competition. * Users can also see a list of competitions by season when accessing the league home page. 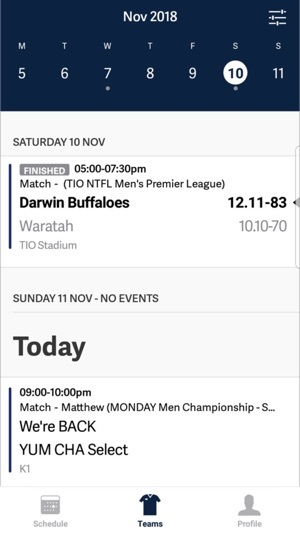 * Those of you who like to look to the future from the schedule screen can now toggle back to the current date with the tap of a button when scrolling past the current date. I was surprised when I realised I needed to remove the old version and download a new one. So many negative reviews about email sign up and stats. However, none of that is true for this current release. I had a super easy process to register the app and then all the teams were there and ready to go. Stats were easy to find. Really nice update. Well done! Wow! This app has changed my life. I can now play soccer and basketball and get all the information that I need in the one spot. I would recommend it to anyone who does more than one sport, even if they do one sport i'd recommend this app. It makes everything so much easier. The app doesn’t stay open for longer than a couple of seconds, cannot look at the teams I have saved or add any others as app shuts down once you click on anything. Please fix this as need to access numerous fixtures that are only available through your app, extremely frustrating I have sent 2 emails advising I can’t use app and received no response. 🤬 Bring back the old app that actually worked!